After our rock n roll start to the day at the Great North Museum and Quilliam Brothers, the Beer Man and I got back on more expected track with a visit to the Wylam Brewery. 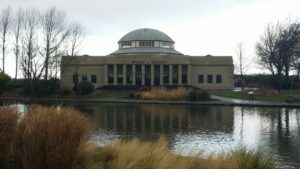 Housed in the former Palace of Arts in Exhibition Park, this is one of the most impressive brewery locations you’re likely to find. It feels like a shrine to the noble hop and once inside that feeling is redoubled. The brewery tour was unsurprisingly sold out so we arrived just as the tour finished and the brewery tap room opened. It was just around lunchtime so we gave their small but focussed selection of food a go, too, along with various beers about which the Beer Man will tell you more. We opted for three dishes: toasted corn kernels; some duck and spelt fritters; and smoked aubergine on flatbread. These proved an excellent accompaniment to an exploration of some of their lighter, sessionable ales. The corn kernels were deliciously crunchy and were chomped through with considerable glee. 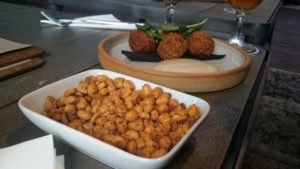 The four fritters were served with a spiced apple puree which very nicely accompanied the crunchy, meaty balls. These were the kind of thing you could have happily sat gorging on all day. 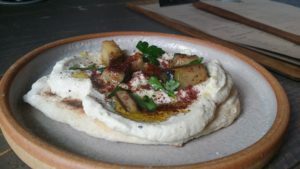 The smoked aubergine puree was topped with aubergine pieces and sumac, then served on a good flatbread to give it hearty backbone. Again, this was full of compelling refinement and could have been scoffed by the hundredweight. 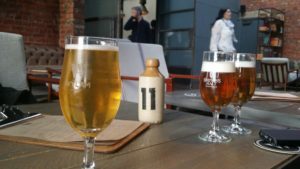 So overall, the Wylam Brewery Tap room served us some excellent beers and some top scran. The place is a joy to behold and should be added to your list for a visit immediately. I’ll certainly be back and look forward to touring the brewery and joyously passing another relaxing afternoon here soon.